The long held crown by the legendary Bugatti Veyron has now been taken away from it. The Hennessey Venom GT has become ‘world’s fastest production car’ after it reached speeds exceeding Veyron’s 415kmph. 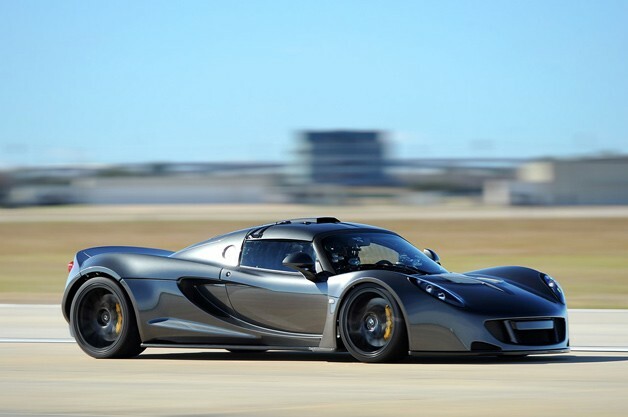 The Venom GT clocked a speed of 427.60 during a test run at the US Naval Air Station in Lemoore. In fact, this was not even Venom GT’s top speed. Top speed of the car could not be achieved in this test run since the driver ran out of road. During this test, the Venom GT was equipped with 7.0-liter twin-turbo V8 engine capable of producing a peak power of 1261PS and a peak torque of 1564Nm. Two VBOX 3i data logging systems were used in the presence of VBOX officials to monitor various data related to the race Bugatti Veyron. Do have a look at the video of this awesome test run given below.